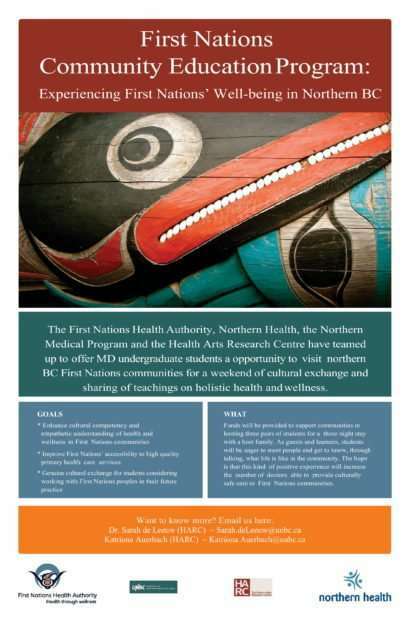 The First Nations Health Authority, Northern Health, the Northern Medical Program, and the Health Arts Research Centre have partnered on a unique program that offers MD undergraduate students an opportunity to be immersed in a northern BC First Nations community. The opportunity is designed to have medical students deeply absorbed into a northern First Nation community and thus provide future physicians an opportunity to critically and creatively reflect on their own understandings about health, wellness, resiliency, capacity, and culture in northern First Nations. 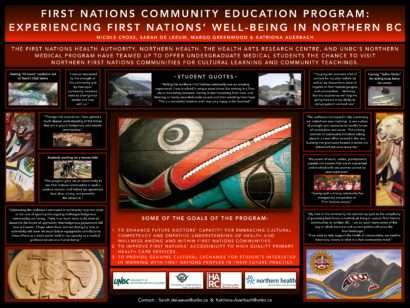 – To enhance cultural competency and empathic understanding of health and wellness in northern First Nations communities. – To improve First Nations’ accessibility to high quality primary care services. – To provide genuine cultural exchange for students considering working with First Nations peoples in their future practice.